Spectacular breathtaking views from every room! 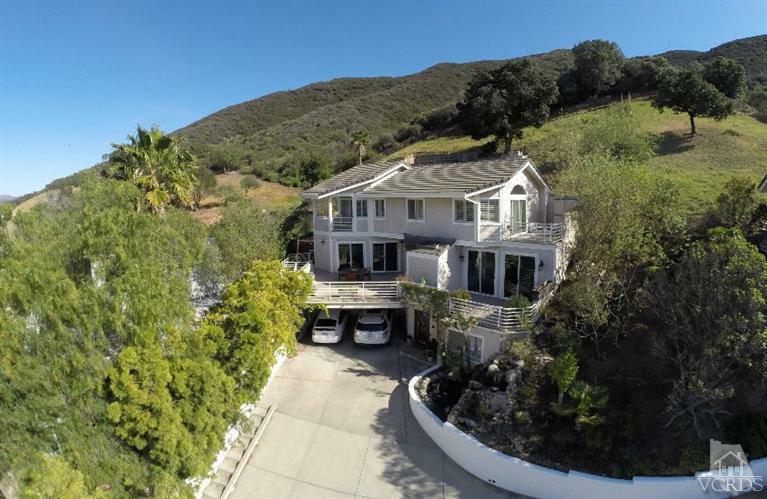 Nestled among the hillside, secluded w/privacy & panoramic views of the city lights & majestic mountains is this stunning tri-level 3BD 3.5BA custom Ventu Park home. This move-in ready home features spacious living room w/granite fireplace, soaring vaulted ceilings, recessed lighting, skylights, beautiful hardwood flooring, ceiling fans, dual-paned windows, plantation shutters, spiral staircase & oversized 2-car garage w/built-in storage cabinets. The kitchen boasts granite counters, gas cooktop w/pop up ventilation, large pantry, flat screen TV & stainless steel appl., trash compactor, double convection ovens & subzero refrig. Each bedroom is complete w/its own bathroom, walk-in closet & private balcony. Enjoy the sunsets & outdoor living from the oversize view deck on the 2nd story. If you dislike the cookie cutter concept, you will love the tranquil, private setting of this unique home close to hiking & extreme mountain biking trails.